We’ve been in our new house for more than a year, and I have added several trees to our already wooded landscape. 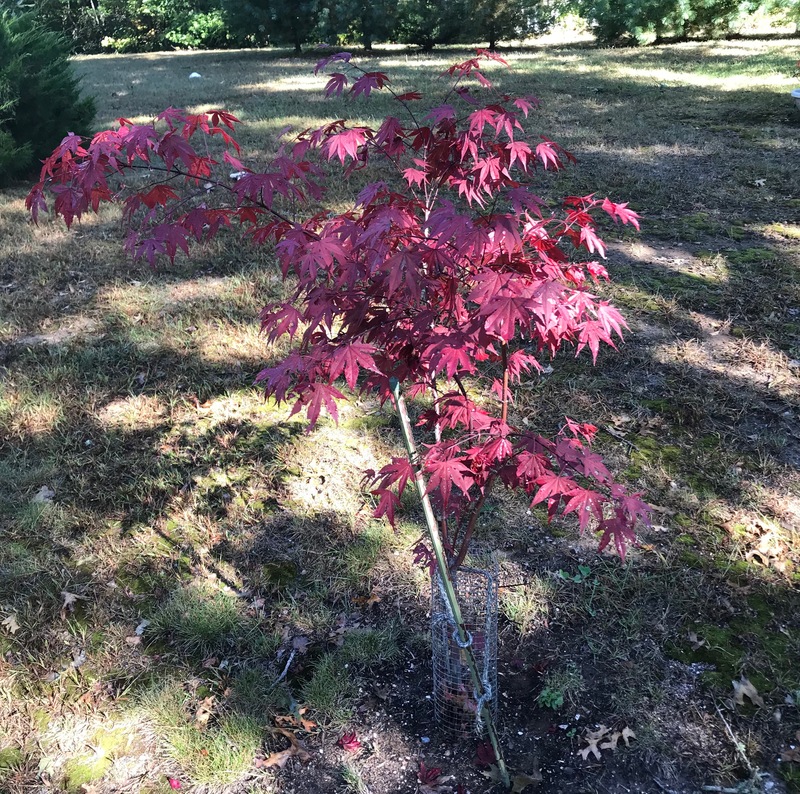 The Japanese maple in the photo was a housewarming gift from friends, right after we moved in the summer. It is Acer palmatum Tamukeyama laceleaf. 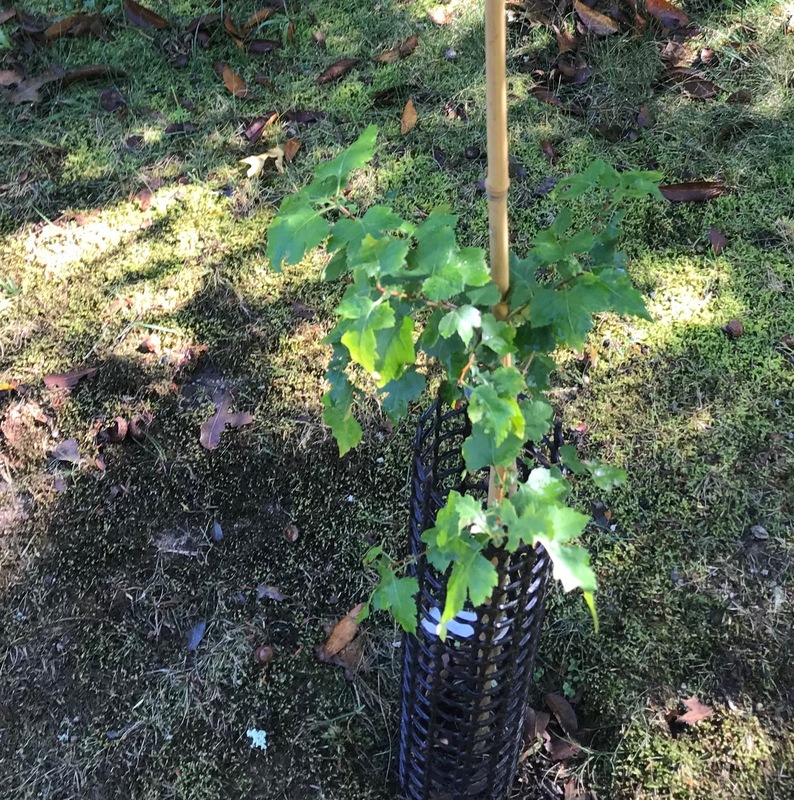 With protection from voles and rabbits and watering during hot dry spells, this tree has grown and thrived. 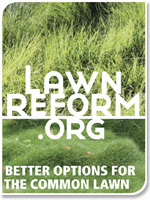 It also adds interest to the predominantly green landscape in our front yard. Then last fall, another friend gave us several trees from the Arbor Foundation. The problem was, they didn’t deliver them until December, (really????) when the ground was too hard to plant them. My friend found some soft earth next to her house and planted them there for the winter. I went to get them in early spring – March if I recall – and they were a sorry sight, a collection of small sticks. I dug them up and planted them at home and then I waited for them to begin to grow leaves. 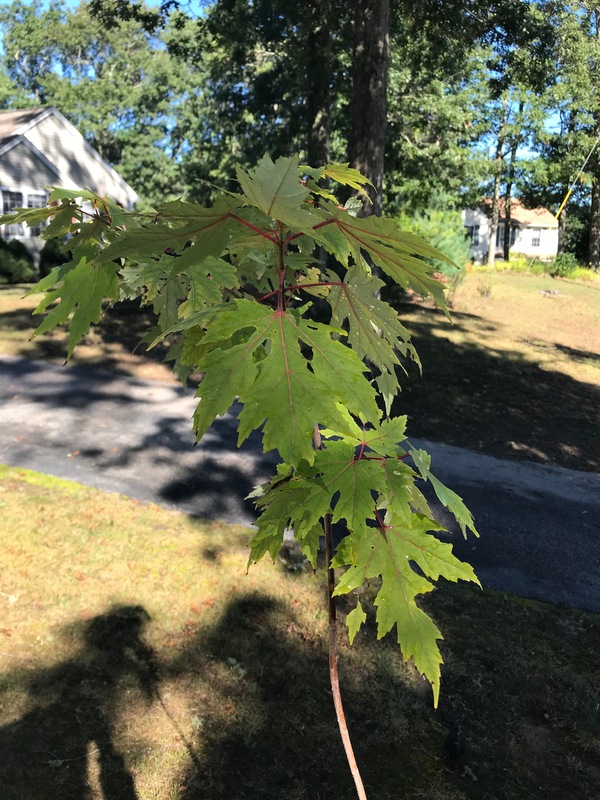 The only one that showed any life was the supposed red maple, Rhode Island’s state tree. Here it is, a very pretty tree, although I am not sure it is a red maple. The leaves look different, almost like silver maple leaves. I would appreciate your comments on what you think this is, because I can’t accommodate a silver maple in that spot. The other trees were three dogwoods, species as yet unknown, (labels missing) and a Washington Hawthorn. All were twigs, just a couple of feet high. The dogwoods put out a couple of leaves after a month or so, but the hawthorn did nothing. A friend who knows about trees stopped by, snipped off a tiny branch and pronounced it dead. I didn’t have time to remove it, but I continued to water it when I watered the dogwoods, and one day in July (yes, July, four months after planting) I noticed that it was sprouting leaves. This small tree will have pretty white flowers in the spring, red foliage in the fall and even berries for the birds. I’m surprised and delighted that it survived, and I have already protected its trunk for winter. Here’s one of the dogwoods. I believe this is a gray dogwood, a native species. Corrections are always appreciated. 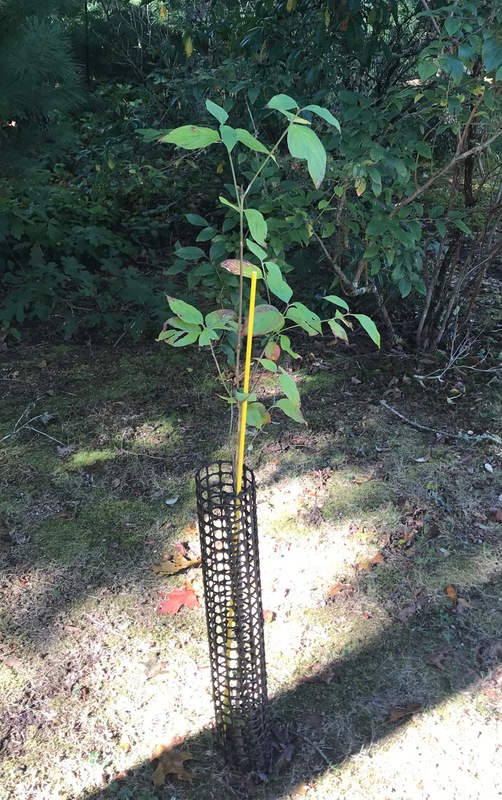 After a successful growing season, all the new trees should be fine going into fall and winter. Gardening is always an opportunity to learn, and I came away with two valuable lessons from this experience: keep watering and be very, very patient. I enjoyed your water and wait stories – same here. Never give up. I have a very healthy 3 ft plus Stewartia japonica if you’re interested. I’d suggest waiting until spring to plant. Of course, it’s not a native. We’ve so enjoyed its bark in winter. gorgeous. One of my exceptions to “plant native”. Sure! Can you keep it until spring? Do you have the space until then? Thanks! DN, yes, spring, it is. Am so happy to share this with you. Will be in touch then. And yes, let life rock on. Whenever I feel the need to groan and ache after heavy gardening. I reframe my feelings as “thank heavens that I can do this work” – albeit more slowly than a few yrs ago. Keep on trucking!